Tropical Storm Emily has Formed… Will it Affect the Area? Tropical storm Emily has formed in the Caribbean, and will threaten the East Coast this coming weekend. 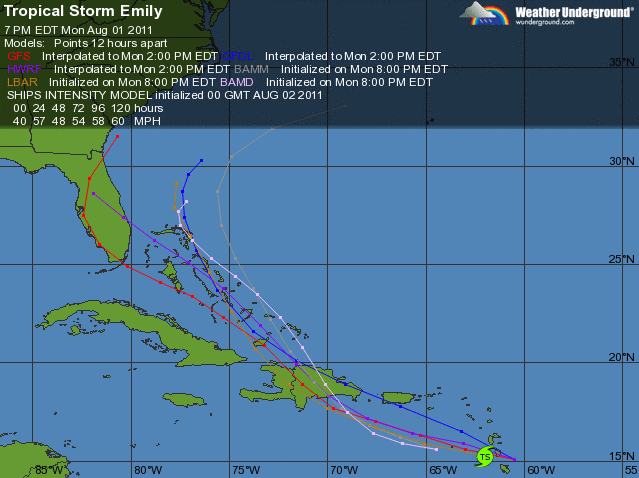 Emily will cut through the Dominican Republic and the Bahamas before cutting North and then Northeast. Right now, the position of Emily all depends on a frontal boundary that will pass through later in the week. If the boundary is weaker and comes in later, Emily will go further Southeast and threaten the East Coast. If the boundary is stronger and faster, then Emily should go more Northeast and will not be a threat to land. Right now, the models are pointing to a more South and East track, but the tract will likely change over the next few days. Temperatures will improve Wednesday (low 80s) before going back into the 90s for the weekend. July 2011 was the hottest month on record for the Philadelphia area. August doesn’t look much better.